I picked up this set from someone who had it on static display for many years. I quickly tried powering it up using the 12v socket & connecting a playstation as a source. There was a fair amount of snow & could hear from sound when I tuned around, but not much of a picture. I don't want to run it for any longer than I need to in case I do any damage. I've got the feeling it might need more TLC than I can offer it. I am not aware that the Sony Playstation has a built in RF Modulator. The SONY external RF modulator for PS1,2 & 3, Part Number CHPH - 1122, outputs on ch36. Alternatively, a SONY Accessory will provide composite or S video and stereo sound. PS4 and PRO are HDMI only for which an interface HDMI to composite video will be required before an RF modulator can be used. All this is detailed in the various instruction manuals. Should you be using the composite lead, snow on the picture suggests that the TV is not switched to video in, should the TV support this. Thanks I'm using an external modulator & have tuned into channel 36. There seemed to be some kind of image when the sound was clear but adjusting the horizontal & vertical holds didn't bring out anything too meaningful. Usually, when a RF modulator is used, the TV will show a blank raster when tuned to it without a video input not "snow". Whilst it would be useful to know the playstation model, check first if the "snow" clears when the lead is disconnected. If it doesn't then first check the modulator is working on another TV with and without video input. If OK then double check the Samsung is tuned to ch36. If it is, then its down to the modulator. I've can another try & the attached picture is the best result I've managed so far. The picture is being squashed sideways. Well, I'm glad to see that the snow has gone and now you can see what's what. The picture you have photographed shows that the horizontal frequency is running at twice the correct frequency. This will also explain why the width is narrow. The hor. freq. is adjusted by either a horizontal hold control or, more usually with newish Samsung's, the horizontal oscillator coil. Such a coil will be close to the LOPT and have an adjustable core. I can't find the schematic so should you be unable to find the control or coil, take some pictures of the chassis and post them. My guess is that should there be no control, the set might have been subject to physical distress ie dropped and the horizontal oscillator adjustable core disturbed which you need to reset. There is a horizontal hold control, though it didn't seem to get much better when I adjusted it, but maybe that was because something else is out of line. Until we can see a photo of this receiver both outside and the chassis I not sure forum members can be more helpful. I've looked and looked for pictures of B&W Samsungs but to no avail. I did find a French site which the 309K chassis is referred to as a UWA 12/14" mono but still no schematic etc. I did find one such set which I've attached a photo but who knows if it is yours. Chris, that looks like a colour telly, "mono" presumably referring to the simple sound stages. Last edited by Nickthedentist; 15th Jan 2019 at 11:25 am. I'm going to be busy the next few days, but will try to upload some photos & try out the most recent advice when I can. I've tried adjusting the horizontal hold control & couldn't get any better results then before, the control feels quite loose so something might be amiss. I've uploaded a front & back picture & will try to get some pictures of the inside later on. 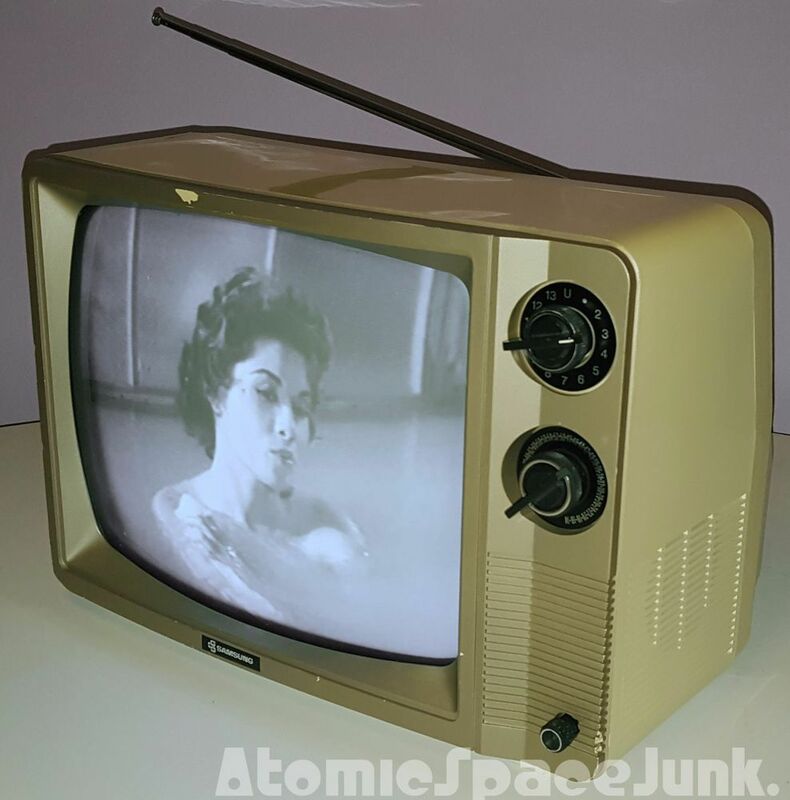 When you get the back off, have a look at the Prinz TV121 on radiomuseum which together with the Waltham and Binatone Visionstar are also made in Korea and have a similar look about them to the Samsung. These televisions are all made for US 525 and European 625 line standards, with their IF response altered, and the horizontal hold (oscillator) control is a user adjustable horizontal oscillator control with a range able to lock the picture on both standards . Make sure there are no dry or broken soldered connections which could cause the fault before adjusting the horizontal hold control which may have been twiddled with. When I've been looking online at 12" sets I've seen a few similar sets with almost the same cases, & probably the same chassis, which shows that badge engineering has been around a while. I hadn't realised Waltham was a Swiss brand, normally their products were sold in the UK at Woolworths & Argos. I've managed to open up the case & take some photos. I couldn't see anything obviously amiss with the horizontal hold control, which is the white bodied component with a spindle adjuster.